How do you make a product look so appealing that viewers feels they have to have it? By investing in commercial product photography services from Dynamic Digital Advertising (DDA), Philadelphia’s cutting-edge digital photography and professional custom website design company since 1995. DDA produces high quality product photography that can help you showcase your products to their maximum potential. Nothing sells a product faster than an image captured by one of our expert photographers. Significantly improve your profit margin by calling DDA for professional product photography services. Even the most innovative product will not sell if it is poorly photographed. A great photo tells a story and speaks a thousand words. Still product photography and 360-degree product photography from Dynamic Digital Advertising provides you with the opportunity to do both. What enables us to produce photos that sell is good digital equipment and lighting combined with exceptional technique and creativity. People buy with their eyes. Stimulate their visual interest with still photographs from Dynamic Digital Advertising. Still product photos capture your product in motion. Depending on your preferences, we can make use of live models to demonstrate how a product is used or we can utilize multiple vantage points and angles to make your product appear dimensionally intriguing. DDA’s still photos are shot in a high-resolution digital format suitable for use in print media and on the web. All of our still photos are optimized before they are integrated into your specific advertising medium. In addition to high quality stills, we are capable of creating 360-degree product photos that allow website visitors to virtually interact with products. Use 360-degree photos in your website or in your next multimedia CD-ROM/DVD presentation. At Dynamic Digital Advertising, 360-degree product images can be captured using digital photography and video or they can be completely computer-generated using DDA’s 3D modeling services in our state-of-the-art studio. To market effectively, we ensure that you receive user-friendly photos that offer a full range of motion. Need to launch a new product? Want to market expanded or updated product lines? Attract potential customers and sell your products with digital product photography services from Dynamic Digital Advertising: contact us for more information. Pharmaceutical advertising is a fierce competition. That’s why DDA Medical, one of the leading professional pharmaceutical advertising agencies, knows the importance of reaching physicians with smart and impactful medical marketing strategies. With increased patient numbers and the onslaught of direct mail pieces, many physicians have turned to the Internet for answers regarding diagnosis and treatment. DDA Medical offers medical website design and development as one of the many medical marketing services aimed at direct-to-consumer and business-to-business medical advertising. Other DDA Medical services include, but are not limited to, Medical Video Production, Medical Trade Show Graphics, and customized customer relationship management (CRM) systems. For more information on advertising ideas for the pharmaceutical industry or medical advertising that will set your company apart from the rest, contact us today! Use your product photography on your corporate, multimedia, or e-commerce website. 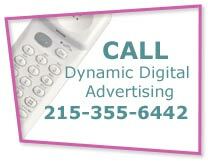 Dynamic Digital Advertising was the first digital photography studio in Pennsylvania and has now become a pioneering custom web design and development company. We can take pictures of your products, either in-studio or on-location, and integrate them within the website design so that they emphasize only the best attributes. We can even turn your product photo into a 360-degree rotation for enhanced interactivity. You specify the need and well create the design and produce the tools that exceed the expectations of even the most discerning client. Generate a more profitable revenue stream than you ever thought possible with custom graphic designs for sell sheets from Dynamic Digital Advertising. Our graphic designers blend product features, branding, pictures, graphics, and contact information in a space typically limited to the front and back of an 8 x 11 paper. We know how to create a dynamic balance that works to get people interested and generate more business. Although we have produced innumerable sell sheet graphic designs for companies from most every industry segment, this is just one of our many available graphic design services. As a full-service graphic design firm, DDA has everything you need under one roof.